Be a part of protecting and preserving this historic wild herd, the land, and the State Horse of North Carolina! The Corolla Wild Horse Fund is a non-profit, registered 501(c)3 public charity and does not share ANY information regarding our donors, members, or volunteers with any other group or organization. Members can also use these online forms to renew your membership! CWHF Sustainer memberships make supporting CWHF mission easy on the budget by dividing memberships into automated monthly contributions. Sustainer Memberships start as low as $5.00/month and renew automatically. See also Charter and Patron Memberships, below. When you join online, you can set your traditional annual membership to renew automatically every year (or not). See also Charter and Patron Memberships, below. Purchase a gift membership for a friend, relative, family member, or organization! Click the link and print the membership form. This form may also be used for renewals. You may also call us to join by phone: 252-453-8002. ($750 or more per year). 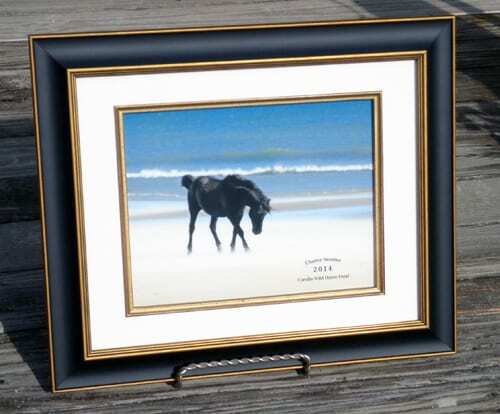 • Charter and Patron receive a beautifully framed wild horse photo. Two Socks: by Karen Fonteneau of Attleboro, MA. This image is also the cover of our 2014 CWHF calendar, which is dedicated to the memory of Two Socks. In a tragic accident that haunts us to this day, Two Socks, a strong and graceful stallion, was hit by a car on the beach north of Corolla, NC. He died on Memorial Day weekend of 2012. Please call 252-453-8002 to arrange for a private visit to the CWHF rehabilitation facility when choosing to become a Patron Member.